If you’re one of those people who aren’t interested in a complete strategy chart for a game like deuces wild, then you’ll be interested in this plain-talking simple deuces wild tips page. It’s just a list of strategy suggestions that will help you minimize your losses and maximize your winnings at real money Deuces Wild video poker. 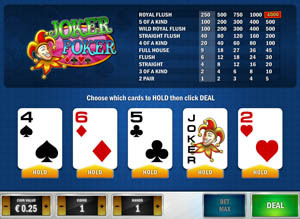 Here’s a page for you if you are long to play Deuces Wild for free without depositing money. • There’s no such thing as a single high card in Deuces Wild. The ONLY time you’ll hold a single card in Deuces Wild is when you have a deuce. • NEVER discard a deuce. If you have a draw to a natural royal flush, you might think about it, but don’t actually do it, because it’s a mistake. • Never hold a single high card along with your deuce. Holding a high card with a single deuce only hurts your chances of making a good hand. • Always keep a pair over 4 to a flush or 4 to a straight. • Never hold 2 pairs. Always hold one pair and draw 3 cards. • It doesn’t matter which of the 2 pair you throw away. • Don’t kick yourself over your decision after the fact either. • Avoid a Deuces Wild machine that pays less than 5 to 1 on four of a kind. • Four of a kind accounts for over 1/3 of your total return in Deuces Wild. That will help you understand why you don’t hold 2 pairs or 4 to a flush or a straight.